It is that time of year again! 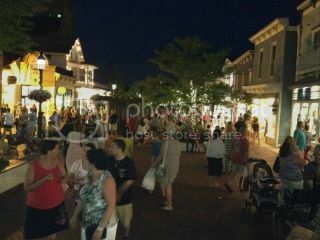 Each August CapeMay.com sponsors a “Best of Cape May” contest. I’m proud to say that The Queen Victoria has come out on top (in 4 different categories) for 4 straight years. Will you please help us make it 5 straight years? PLEASE click on the picture above or the link below and cast your ballots for The Queen Victoria. This is a great way to tell the world how you feel about The Queen Victoria and all your favorite shops, restaurants and other haunts in Cape May. There are lots of categories to cast votes for and I encourage you to vote for us in as many as make sense to you. You don’t have to vote in every category, but there are a few required categories. Don’t wait too long. The contest ends on 8/28/12, so you have to vote right away (sorry about not telling you about it sooner). Thanks in advance! I’m hopeful/confident that you’ll put us on top again. Get Uncorked in January … On Us! 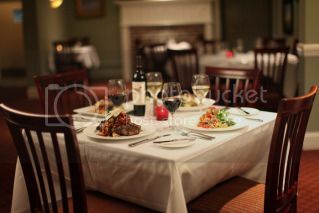 Last winter the Washington Inn put together a special wine pairing dinner package for us called “Cape May Uncorked”. We introduced it to our January guests as a complimentary package ($100 value) for any 2 night reservation in a premium room or luxury suite. It was hugely popular, which didn’t surprise me at all. Given the success of this special offer, Anna Marie and I have decided to do it again next January. Reserve a large premium room for any weekend in January and we’ll treat you to an amazing wine pairing dinner at the Washington Inn. This is the same great package that hundreds of you have enjoyed this year. It was a great deal at $100. It is unbelievable for free. Seriously, a complimentary dinner at one of the top 100 restaurants in America! Can it get any better than that? Every time we offer a Channeling weekend with Craig McManus it sells out … early. The explanation for that is simple. Craig is the real deal. He is truly amazing. That is why I’m thrilled to say that Craig has just agreed to another event at The Queen Victoria on February 9th, 2013. 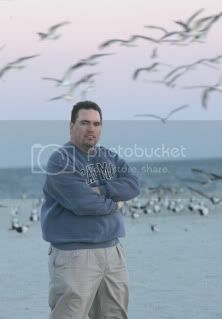 Many of you have read Craig’s series of books “The Ghosts of Cape May”. His meticulous research and fascinating accounts of “encounters” with ghosts throughout town have brought him a strong following. That is just a sideline for Craig, however. His true calling is channeling. In fact, his website is www.channelcraig.com. I’ve sat through a couple of Craig’s channeling sessions and I’ve talked to guests who have experienced the rest of them. Every one of those people will tell you that Craig is incredible. He channels your loved ones and describes them in detail that you will not believe. He is simply amazing. If you’re looking for a different kind of experience and have an interest in hearing from a departed loved one, Craig is the guy that can make it happen. Don’t wait too long to make your reservations for this weekend, because we’re limiting this event to 20 people (2 sessions of 10 people each). It is definitely time for all of our “wine lovers” to start making plans for their next wine bending weekend at The Queen Victoria. This event was VERY popular last year, with more people participating than ever before. It just gets better every year! For those of you who haven’t experienced this wonderful event (my favorite of the year), let me tell you about it. On Saturday Feb 23 you’ll make your way to Cape May Winery shortly after lunch. When you arrive you’ll sit down at one of several tables, perhaps with your friends or with some folks about to become friends, where you’ll find 4 glasses of red wine sitting in front of you. You’ll sample each, exploring the characteristics of each using the scoring sheet provided. After that you’re off and running with your table partners in a quest to formulate the perfect blend. Usually each table member suggests a blend and some method of tracking/scoring each is agreed upon. Once identified, your table will submit a decanter of that blend to the host and you’ll be whisked off for a tour of the winery. Upon your return you’ll find a glass of each blend (the more tables, the more blends) that you’ll get to “blind” sample. A show of hands for the best blend decides the winner, which will be bottled with a customized label for you. You’ll get two bottles as part of the package and you can purchase additional bottles from the winery. It is usually several weeks before the wine is actually ready for bottling, but Cape May winery will faithfully recreate the winning blend and bottle it for you. Most of our guests choose to collect their wine on a return trip to The Queen Victoria, but it is possible to ship it to you as well. If you just can’t make it back to The Queen Victoria, we’re happy to ship your original two bottles to you. We’ll simply pass along the additional shipping charges for any additional bottles you may decide to purchase. If you love wine, you’ll love this event. Call soon to reserve your room, as this event will sell out the inn! I usually tell you about upcoming events in most of these segments. In fact, in my last newsletter I did tell you about this amazing event that was held on 8/11/12. Even though this one has already occurred, I just had to tell you about it. It was truly amazing. On August 11th the Mid Atlantic Center for the Arts & Humanities (MAC: the non-profit which does the trolleys, the lighthouse and most of the tours in town) sponsored their 1st Annual Craft Beer & Crab Festival to raise funds for educational outreach. It was WILDLY SUCCESSFUL; far beyond anybody’s wildest expectations. Despite a generally rainy day, over 5,000 people showed up at the Emlen Physick estate and enjoyed a day of great beer, crabs, great food and entertainment for the entire family. It was so popular, in fact, that they ran out of food and beer not once, but twice. Luckily, the logistics were pretty solid and they were able to replenish their supplies of both quickly. Next year’s festival is already being planned and I think it will be even better than this year’s. If you didn’t attend this year, start making plans to do so next year. If you did attend, then I hope you’ll make it a tradition and return again next year. It is sure to be a better event next year and I’m pretty sure they won’t be running out of anything next time. If this picture isn’t enough to make your mouth water and make you hungry, nothing will do the trick. 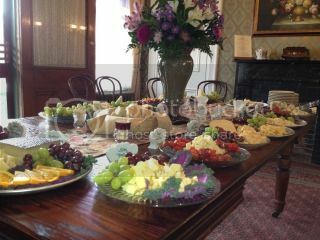 This was taken just before our guests descended upon the table full of cheese we put out for our 2012 Big Cheesy event. It was a great event, with several of you making it an annual tradition. It felt a little bit like a reunion of old friends gathering for wine & cheese. Every year about the same time we host a cheese tasting party that is absolutely free! It is a wonderful event that is always enthusiastically embraced by our guests at the inn. Invariably we have a few guests who were unaware that their reservations coincided with this world renowned event. They’re usually pretty happy about it when they discover a buffet of 15 to 20 cheeses awaiting them on our dining room table. Some folks take the tasting very seriously, using the cheese tasting scoring sheets that we provide. Others simply enjoy sampling the various cheeses and drinking wine. Everybody has a good time. Speaking of wine, this is a “BYOB” event, so don’t forget to bring a bottle of your favorite wine. It usually turns out to be a wine sharing experience as well, so be sure to bring something you’re willing to share. Come to think of it, it is as much a wine tasting as it is a cheese tasting party. Wow, here it is the end of August with Labor Day looming in the wings. Where did the Summer go? Well, for lots of you a nice little slice of it happened in Cape May this year. It has been a wonderful summer and we’ve met some really nice new guests. We’ve also welcomed back literally hundreds (perhaps a thousand or more) of our terrific previous guests (that would be you!). Anna Marie and I are always thrilled when Summer arrives and a little sad to see it passing. That is more than compensated for by our excitement about the Fall, however. Fall is our very favorite time of the year. I know that lots of you agree. Believe it or not, we’ll be as full this September as we were in July. Obviously, the secret is out about September. The good news is that we still have some very nice openings in the middle and latter part of September. Sure, they’re going fast, but you still have time to put your name on one of our beautiful rooms. September is too busy for you? Well, how about October? Between Victorian Weekend, the Cape May Wine Festival and all of the Halloween happenings, October is one of the most entertaining times to visit. It is also incredibly relaxing and comfortable with some welcome relief from the brutally hot summer we’ve all been experiencing this year. Of course, Christmas is right around the corner too (it is a very big corner, obviously), and it starts early in Cape May. No matter what excuse you choose for your return to Cape May this Fall, the time is right to start making your plans. We truly are starting to fill up for the Fall and we don’t want you to miss out on the fun. This has to be the roughest photo you’ve ever seen me publish of a room, but I wanted to give you a “sneak peak” of our newest room. The Empress is an amazing new room on the 1st floor of the House of Royals that we will be opening up this Labor Day weekend. 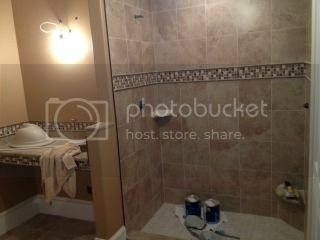 It is in the final stages of construction, as evidenced by the paint cans sitting in the shower and the upside down sink on the vanity. I’ll probably feature this room again soon, once the photographers come, so you can see it in all of its glory. So what makes the Empress so special? I’m SO glad you asked. Let me tell you about the bathroom first, since that is what the picture is of. First of all, you should really think of this room as a spa. With a 2 person bubble jet tub, a big 2 person/2 head shower (pictured), the marble medallion in the floor, and the toilet in a separate “water closet” room, you really don’t feel like you are in a bathroom. The tiling is really special as well, adding to the experience and feel. Can’t you just picture yourself luxuriating in this room in complete comfort and opulence? In the bedroom you’ll find an incredibly dramatic setting starting with the breathtaking king sized hand carved mahogany bed. It is a good thing this room has 11.5 foot ceilings, because the bed towers over 9 feet high. Opposite this dramatic piece of furniture is a custom built gas fireplace that will amaze you. Above the fireplace you’ll find a 42″ High Definition TV. A beautiful and distinct Armoire provides closet space in the room. The final touch for the room is reserved parking. This room really does have it all! Bookings are already strong for the Empress, so if you are interested in staying in our newest room for your next visit, you’ll probably want to plan it well in advance. Amazing as it might seem, Charles Dickens is HOT right now. Part of the renewed popularity for this incredible author’s work has to do with the 200th celebration of his birth taking place this year. It is a pretty big deal. Back in the 80s The Queen Victoria put Cape May on the “Christmas Map” by introducing the Dickens Extravaganza in early December. 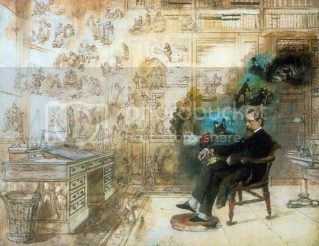 It was hugely popular in great part because of the phenomenally talented and entertaining, Elliot Engel, who brought Dickens Christmas Carol and other works to life for dozens of our guests each year. Over the years Elliot moved on and the Extravaganza dwindled to a dedicated few each December. I’m thrilled to announce that Dickens is BACK! Not only will the famous Elliot Engel be returning for the Dickens Extravaganza this December, but he’ll be joined by several other talented and entertaining folks whose mission is to make sure you have a great time. I know they’ll succeed. This December 2-4 come experience Christmas in Cape May in its original format. Sure, there will be entertaining presentations and theater. 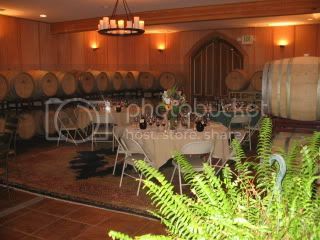 There will also be festive feasts, holiday receptions and wine tasting tours. Mostly, there will be lots of fun for everyone attending. Come for the whole event or just a night or two. You will be so happy you did. I promise. Many of you have heard about the surprise birthday party that Anna Marie threw for me this year. Quite a few of you were in attendance. In any case, Anna Marie completely surprised me for my significant birthday and caught me completely unaware. It was an amazing feat considering that we live, work and play together every day of the year. I honestly don’t know how she did it, because I tend to be a pretty observant guy. In any case, I don’t think I could pull a similar stunt like this over on her, so I’ve decided to go the other way with it. Instead of a surprise, I’m turning it into an event. I’m throwing Anna Marie a big party and you are invited to attend. You’ll notice I haven’t mentioned how old Anna Marie is going to be. That is because you need to GUESS how old she’ll be. Your incentive to guess her age is the discount that we’re going to extend to you for your weekend at The Queen Victoria. Whatever age you guess will be the discount that you’ll receive each night you are here (2 night minimum). That means that you have an incentive to guess the highest possible age to maximize your discount. There is a catch, however. If you guess over her actual age (the age she’ll be turning on March 7, 2013), then there is no discount at all. So guess as high as you think is safe without going over her age and get that amount discount each night of your stay that weekend. Another way of looking at it is you need to balance your desire for maximizing your discount with the natural desire to tell Anna Marie how young she looks. Guessing she will be 60 would be bad for several reasons, obviously. I hope you’ll make plans to join us for Anna Marie’s birthday celebration next March 9. It is going to be fun and it will be a great deal for you. Give us a call and take a guess at her age. Careful now, you wouldn’t want to insult her in your quest for a bigger discount! March is shaping up to be a FUN month at The Queen Victoria. 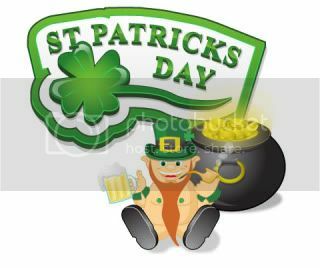 You’d think that a place with a name like ours would perhaps frown on an Irish celebration, but there you would be wrong! I say let’s celebrate St. Patty’s Day in style. I’ve recently become fond of a few different Irish Whiskeys and it occurred to me that it might be fun to build an event that gives me an opportunity to try even more. I know that lots of you have opinions about this topic too, so I’m hoping we can have a great time exploring the differences while celebrating dear old Patty. Now we can’t legally serve alcohol, but we can certainly allow you to. That means that this will have to be a BYOW event (that is Bring Your Own Whiskey, of course). My thinking is that each of you can bring a bottle of your favorite Irish and I’ll bring a bottle of mine and we’ll do blind tastings. Chances are we’ll get a few duplicate bottles of Jameson, Bushmills, etc., but it will go to good use, I’m sure. I’m hoping some of you will bring something a little more obscure to throw in the mix and make it interesting. At the end of the day I’m sure we’ll all agree it is good to be Irish (at least for a day). No St. Patrick’s Day celebration could be complete without some traditional Irish fare, as well, so we’ll have chef Bill Walters prepare some special treats for sustenance during this event. Let’s make this a St. Patty’s Day to remember. This could be the start of a beautiful tradition at The Queen Victoria. I love this photo. It has all the elements of the Cape May beach that I love. 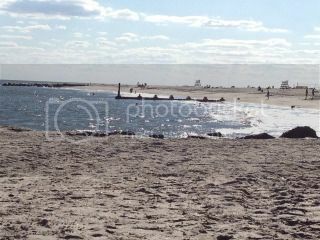 First of all,it is at the end of a beautiful Summer day, as evidenced by the lack of people on the beach. Only the hardcores are still there this late. It also contains a couple of jetties, which not only keep our sand safely in place, but also provide beautiful contrast and crashing & splashing waves. Did you notice the life guard stands? Every beach town seems to have their own design, and I’ve always fancied Cape May’s, even before we moved here. Finally, the blinding sparkle of the setting sun on the wave as it recedes back off the beach. I guess you can tell I love our beach. I know you do too. Cape May Stage’s latest production is by all account a tremendous hit. Hilarious is the adjective I’ve heard most often from guests who have seen it. Anna Marie and I have a date to see it ourselves next week. We can hardly wait. From the photo you might surmise that it is somehow related to Hitchcock, and in that you would be correct. I don’t think Hitchcock was ever this funny, though. Mix a Hitchcock masterpiece with a juicy spy novel, add a dash of Monty Python and you have The 39 Steps, a fast-paced whodunit for anyone who loves the magic of theatre! This 2-time Tony® and Drama Desk Award-winning treat is packed with nonstop laughs, over 150 zany characters, an on-stage plane crash, handcuffs, missing fingers and some good old-fashioned romance! A riotous blend of virtuoso performances and wildly inventive stagecraft, The 39 Steps amounts to an unforgettable evening of pure pleasure! If you’re visiting us in the next couple of weeks, be sure to make plans to see this show. If you don’t have reservations yet, we actually have a few select openings in the next couple of weeks still available. What a great excuse to come for a visit! Anna Marie and I returned to Martini Beach last week and had a wonderful meal. For those of you who haven’t already been there, Martini Beach is a 2nd floor restaurant looking over Cape May’s beautiful beach. It is definitely the place to go for dinner with a view. From the name you might assume it is simply a place to go for a martini, but I can assure you it is more of a restaurant than a bar. I’m guessing they have great martinis, with that name they should, but I’ve never had one, so I can’t judge that. What I can do is tell you how great their food is. On this last visit, Anna Marie and I opted to explore the Tapas menu. We’ve never done that before, and it seemed somewhat decadent. Ordering a bunch of appetizers for dinner is way outside our normal thing, but we really did enjoy it. It was loads of fun. Anna Marie ordered the Calamari and Sea Scallops, while I ordered the Lobster Mac ‘n Cheese and the Mini Crab Cakes. We shared everything and really enjoyed the entire experience. Between the view, the food, and of course, my beautiful date (I had to throw that in there), it was a perfect night out. I suggest you plan on a meal at Martini Beach during your next visit to The Queen Victoria.